Like other Baby Boomers I fondly remember those E-Tickets that used to come in the Disneyland California old-fashioned paper ticket booklets when your mom and dad paid for the family's admission to the original Disney theme park. 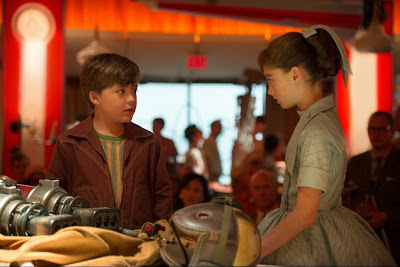 So forgive me for feeling a little nostalgic for those days gone by as I share with you about something really cool that Disney is doing leading up to the Tomorrowland movie release this coming weekend. A fun promotion is planned ahead of Friday's nationwide big screen release of the live action film Tomorrowland. For movie enthusiasts who attend Thursday, May 21, 2015 showings of Disney's newest major motion picture in select theaters, you'll get a collectible Tomorrowland E-Ticket. Note this vintage style E-Ticket is only a promotional item, it does not grant entrance into any of the Disney Parks or Facilities or grant any other rights to the holder. What's more is if you Tweet a photo of your E-Ticket w/ the hashtag‪ #TomorrowlandETicketSweeps‬ you'll also get a chance to win a signed movie poster! You must be 13+ to participate. No purchase is necessary and this promotion ends 5/24/15 at 11:59:59 pm PST. Get a complete list of participating theatres showing Tomorrowland on May 21st as well as official rules for the related promotions by visiting the Tomorrowland official Facebook Page. FTC Disclosure: Disney provided the image that appears in this post as well as invited MommyBlogExpert to a screening of this upcoming movie prior to release. No payment or other compensation was received in connection with this post and opinions here are my own. See complete FTC Disclosure information that appears at the bottom of MommyBlogExpert's home page and at the bottom of every individual post on this blog, including this one.